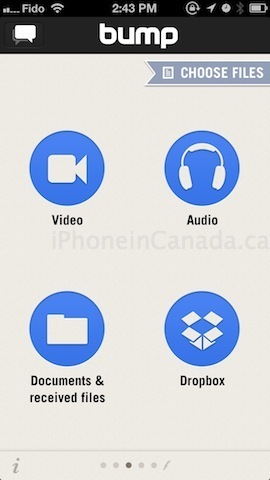 Popular file sharing app Bump has been updated to share files from Dropbox, which builds on its former update to introduce file sharing for videos, audio files, and documents on your iOS device. What’s also great about Bump is the ability to quickly share photos to your computer web browser by visiting http://bu.mp. How to setup Dropbox with Bump? Easy. 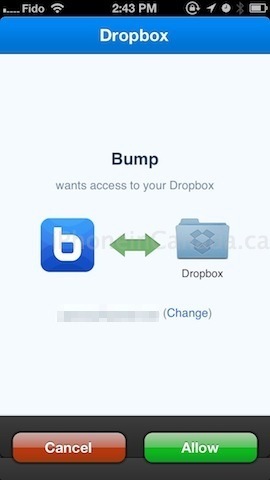 Swipe to the third screen, tap on Dropbox, then you’ll be asked to approve permission for Bump to access your Dropbox. Once it’s setup, you’ll see your entire Dropbox file hierarchy and away you go, ready to send any file to a friend also using Bump. The current design of Bump 3.0 was launched in February of 2012. As of last December, the company notes Bump has been downloaded over 100 million times. Click here to download Bump from the App Store–it’s free.